Catholics venerate Saint Cecilia as the patroness of musicians. Mariachis (performers of traditional Mexican music) celebrate the feast day of Saint Cecilia (November 22) as their “professional holiday”. On this day, they fill the streets of Mexico City to celebrate the patron saint of music with festive songs. Mariachi is a style of music and musical group performance that originated in the rural areas of Guadalajara in the 18th century. It is believed to have developed from Andalusian music brought to Mexico by Spanish immigrants and influenced by indigenous music. The present-day mariachi music formed in the first half of the 20th century. A typical mariachi group includes 3 to 12 musicians, although its size may vary. 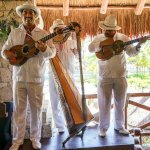 The usual mariachi group consists of at least one guitar, a guitarrón (a very large acoustic bass guitar), trumpets, and violins. Sometimes a Mexican folk harp, a flute, and/or an accordion are also included. There is generally no lead singer who sings all the songs. In Mexico City, the home of mariachi music is Plaza Garibaldi located in the historic city center. All day long, mariachi groups perform here to solicit gigs from passers-by. These gigs can range from individual songs to performing at family events such as baptisms and weddings. On Saint Cecilia’s Day, the talented mariachis of Mexico City gather at Plaza Garibaldi to honor their patron saint. Clad in traditional costumes, they play songs and march in procession to the Basilica of Our Lady of Guadalupe.